The site only launched a few days ago, but it’s already full of Nazi punchin’ imagery. 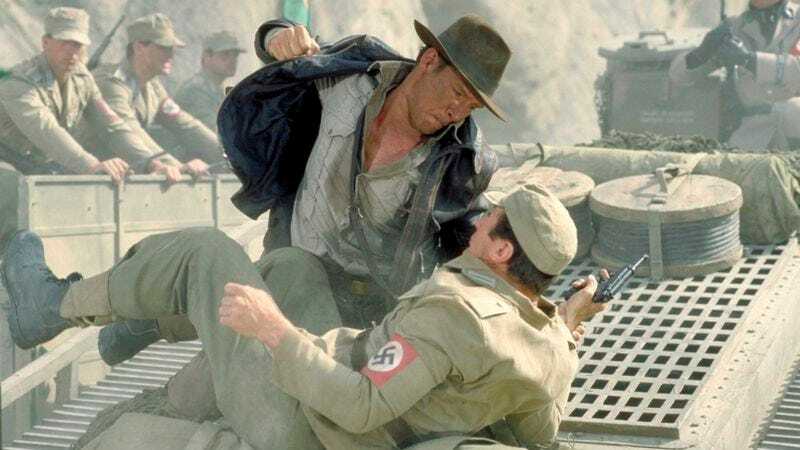 Some of these altercations take place during the 1940s, like Indiana Jones punching Nazi soldiers or Captain America punching Hitler himself. Others offer a more contemporary flare, like Edward Norton confronting his former neo-Nazi colleagues in American History X or J.K. Simmons’ skinhead getting beaten up in Oz. So far the only real-life image is the iconic 1985 Swedish photo of a 38-year-old woman named Danuta Danielsson attacking a neo-Nazi with her handbag. Danielsson’s father was a concentration camp survivor. In terms of pure catharsis, the best (or at least longest) option is an 11-minute looped video of Doctor Who’s Rory Williams punching Hitler over and over again. But first he issues a terse, “Shut up, Hitler!” because even polite British nurses don’t think the best way to deal with Nazis is through a lively exchange of ideas. The full collection is available on Nazis Gettin’ Punched.